Mor Monsen cake (Mor Monsen Kake), I wonder who she is?? 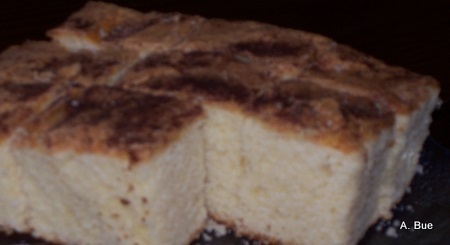 Anyway, my mom always had this delicious Norwegian coffee cake ready to serve. By the way, the word cake is kake in Norwegian, pronounced (ca) as in caviar and (ca) as in (caring. This is my very own method of teaching how to pronounce Norwegian words. Keep stored in a lined plastic container in the freezer. I love to sit by my computer and enjoying Mor Monsen Cake with a cup of freshly brewed coffee in the morning. Add eggs, one at a time, and blend thoroughly after each addition. Mix baking powder and flour before adding. Pour the batter into a 9 x 11" pan, lined with parchment or wax paper and a heavily greased and dusted with flour. Sprinkle with almonds, currants, and sugar. Swirl almonds and currants in to the batter with a fork so it does not fall of when cake is done and sprinkle with pearl sugar on top..
Bake on middle rack of the oven at 350° F. for 30-35 minutes to light golden. Check to see if it is done by sticking a tooth pick or wooden skewer into cake, if batter does not stick to the pick, it is ready to take out of the oven. Cover cake with waxed paper and a cookie sheet and turn the pan upside down on the sheet. Finish cooling on wire rack. Keep this tasty Mor Monsen Cake in your freezer and you're always ready to serve a Norwegian dessert.